Even though it's important to look for the best in people, it's hard not to feel the world would be a better place if people like Tim Frisco weren't around stinking it up. People who are cruel to animals are bad enough, but folks who actually make a living at it, and even seem to take pleasure in it, are pretty much scraping the bottom of the Homo sapiens cesspool. Tim Frisco is the Animal Care Director for Carson & Barnes 5-Ring Circus, which provides animals for the Atlanta-based UniverSoul Circus, appearing in Charlotte beginning Tuesday, July 29. UniverSoul, normally a rather PC, feel-good outfit that promotes family values, self-esteem, diversity, personal empowerment and so forth, seems an unlikely candidate for contributing, even indirectly, to animal abuse. But wait, let's back up a minute. The whole ordeal started last week when we received a press release and videotape from PETA. The animal rights group was criticizing UniverSoul Circus using in their shows elephants that are owned and trained by Carson & Barnes, which owns a fleet of elephants and leases them out to other circuses. Animal Care Director Tim Frisco is part of a well-known elephant training family led by his father, Joe Frisco Sr., who got his start with Ringling Bros. The family is also a prime target of animal rights groups who claim the family exploits and abuses their animals. The videotape included in the PETA press release features Tim Frisco during a 1999 "training" session at the Carson & Barnes headquarters in Oklahoma. The tape is only about six minutes long, but it's six brutal, sickening minutes. In it, Frisco repeatedly beats elephants with a "bullhook" (a wooden or metal pole with a steel hook at the end) and jabs them with an electric prod. Equally upsetting is the way Frisco shouts obscenities at the elephants and the sadistic instructions he gives the other would-be trainers. "Tear that foot off! Sink it (the bullhook) in the foot! Tear if off! Make "em scream!" is just a small sample. (See sidebar for transcript). While the tape left little doubt about the allegation that Frisco abused animals, we checked out PETA's charge that Carson & Barnes -- the company that employs Frisco -- was supplying animals to UniverSoul Circus. After some vague and misleading denials from both parties, we finally got to the bottom of it. And the truth doesn't reflect well on either Carson & Barnes or UniverSoul. We first contacted UniverSoul to see if they are indeed using elephants owned and trained by the Frisco family. Hank Ernest, senior publicist for UniverSoul Circus, denied that they're using any animals trained by the Frisco group. He said they have contracted with Frisco in the past, but not this year. Rather, he said, they are now using elephants from two other outfits -- Miller Equipment and Woodcock Elephants. He emphasized that none of the animals on the PETA film have any connection with UniverSoul Circus. "At some point you may need to question PETA on their tactics," he said. "Their misrepresentation of our circus is shameful. PETA is not going to be satisfied until all animals are free and everyone is a vegetarian. Our audiences go to our shows because of their quality. We've survived for 10 years because we put on an excellent production. PETA only energizes our fans." Coincidentally, one of the groups UniverSoul says it is using, Woodcock Elephants, has also come under fire from PETA. The group cites a 2002 USDA report in which William Woodcock commented to a USDA official that if he gets any defiance from elephants, he'll "beat the hell out of them" and that the elephants will sometimes disobey him in public because "they know I can't hit them with the stick as much." We contacted Carson & Barnes to see what they had to say in response to PETA's allegations and the disturbing videotape, and to see if they still employ Tim Frisco. A. Wilkins, director of advance coordination for Carson & Barnes, replied via email: "PETA's "doctored' tape is over five years old. Mr. Frisco did indeed use poor taste in his language choices. He did not, nor has he ever, abused one of our elephants. Both internal and external investigations were conducted and did not reveal any cause for dismissal of Mr. Frisco. [In December 2002, the USDA fined the circus $400 for improper handling of animals.] The family that owns the elephants that are with UniverSoul still employs Mr. Frisco. 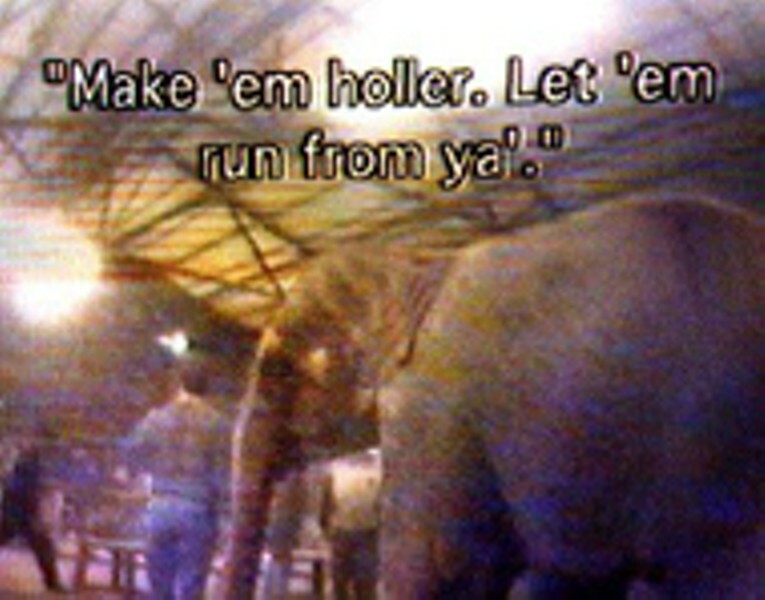 UniverSoul does not have elephants touring with them that were depicted on the PETA video. Mr. Frisco is not with UniverSoul Circus. There are two issues, animal care -- we stand on our record of providing good care for all our animals; and animal rights -- where PETA is pushing a political agenda and using any means necessary to alter the relationships between animals -- humans and other species."